Fresh, crispy salmon fillets are placed on top of delicious bed of paella rice and topped with an herby, fresh watercress sauce. This recipe is perfect for those special occasions. Mix together the olive oil, garlic, lemon juice and salt and pepper. 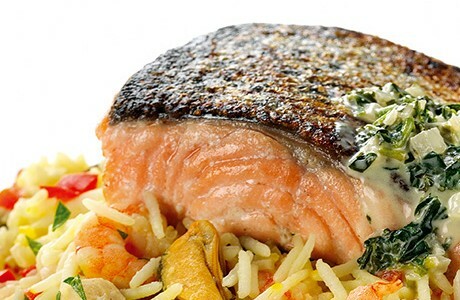 Place the salmon in a shallow dish and pour the mixture over the salmon. Leave to marinate for one hour. Bring a large pan of water to the boil and add the rice. Stir well then lower the heat to a fast simmer and cook for 9 minutes. Place the watercress into a bowl and cover with boiling water, drain and refresh with cold water. Drain in a sieve and pat dry with a kitchen towel. Chop the watercress finely and add to the sauce. Check the seasoning and if satisfactory, place to one side. Put the salmon skin side down into a heated frying pan and cook for 4 minutes until the skin side is crispy. Turn the salmon over and cook for a further 4-5 minutes. The salmon is cooked when it has lost its translucency. Melt the remaining butter in a wok or large frying pan, add the remaining shallot and red pepper and cook for 2 minutes until soft but not translucent. Add the seafood cocktail and juice and serve immediately.